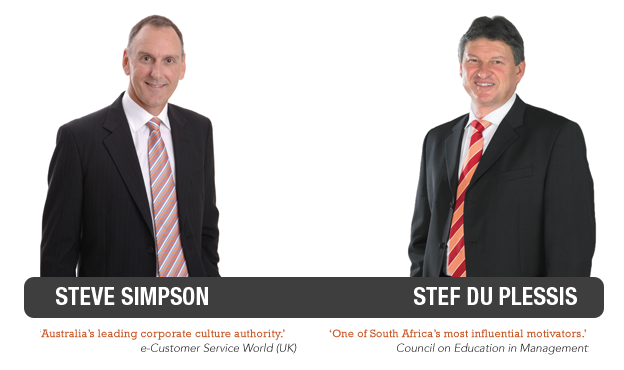 Steve and Stef have been Empowering People and Influencing Cultures since the early 90’s. Between them, they have carried out more than 5,000 assignments on 5 continents, ranging from 60-minute keynote presentations on some of the most prestigious platforms in the world, through half-day to multi-day training & facilitated sessions on the workshop floors and in the boardrooms of leading enterprises, often culminating in company-wide in-house organisational transformation interventions that run for months or even years. They have a track record of success spanning a host of industries, with specific experience in helping their mining clients to safely improve operational performance through engaging their people in the creation of a winning workplace culture across a wide range of mine types such as: Gold, Diamond, Alumina, Coal, Platinum, Iron Ore, Nickel, Bauxite, Chrome, Uranium and Minerals. Their clients include some of the world’s leading brands. In mining specifically, they have worked with more than 50 mines in almost a dozen countries, across a wide range of surface and subsurface mines, smelting and refining operations. They have worked with major industry giants and a large number of smaller companies, including Anglo American, AngloGold Ashanti, Barrick, De Beers, Gold Fields, Harmony, Impala, Lonmin, Norilsk Nickel and Xstrata. Stef du Plessis first started working with mining clients in the early-90’s. Primarily an expert on personal and professional leadership, his focus back then was on employee engagement and strategic implementation – and by the mid-90’s he had built a solid reputation as the go-to resource throughout the South African deep level gold mining industry. By then, two things stood out for him: first, the prevailing belief that safety in mining could generally only come at the expense of production, and second the fact that most safety improvement initiatives seemed to fail – often due to a lack of employee engagement. During this same half-decade Steve Simpson had emerged as one of the Australia’s leading experts on Customer Service – and through his work with a number of leading brands he became increasingly baffled by the mechanistic approach to service improvement. He intuitively knew that there was a link between corporate culture and the way people do things in the workplace – and soon after starting to explore this domain he created Unwritten Ground Rules, or UGRs. When Stef first heard of Steve’s work in the field of UGRs in the mid-90’s, he knew that it held the key to the production vs. safety conflict that then still existed in the mining world. He immediately arranged for Steve to work with a senior team from one of the world’s biggest gold producers, then his anchor client. The team was blown away - and so UGRs for mining was born. This was also the start of a solid partnership between Steve and Stef who have since continued to constantly evolve the UGRs concept through global research and through their ongoing collaborative work with their ever increasing fold of mining clients.